In MHCT, the X-ray beam is still collimated, but image slice thickness is a function of detector matrix selection. By choosing the number of active detector rows, one can select from a variety of slice widths. Depending upon which detector configuration is chosen, the beam is collimated to include all active detectors simultaneously (Fig. 2). Because multiple detectors are used to collect data simultaneously, the traditional concept of pitch is not applicable in MHCT. Rather, a parameter called an effective pitch is sometimes substituted to indicate a comparable value to the pitch used in single-detector helical CT. An effective pitch is defined as table feed per 360° gantry rotation divided by image slice thickness divided by number of active detectors. 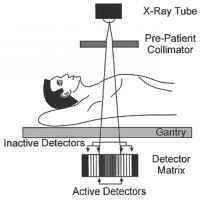 Figure 2 Multidetector helical CT. An X-ray beam is still collimated by a prepatient collimator prior to entering multiple-detector arrays. Slice thickness is determined by active detector selection. selected as the preferred values for clinical scanning: 3.0, also referred to as HiQuality (effective pitch of 0.75); and 6.0, also referred to as HiSpeed (effective pitch of 1.5). MHCT derives its name from its use of multiple detector arrays rather than a single detector array (Fig. 2). These are usually arranged next to one another in a row and form a matrix of multiple detector rows. The detectors can be selected individually or as a group of two to four to increase effective detector thickness. Each detector group is then connected via its own signal-processing unit to a central computer. The central computer then calculates individual image slices through a complex algorithm incorporating data from all active detectors. Current technology in computer- and data-analysis capabilities limits simultaneous detector use to a maximum of four channels. Each channel may contain the output of a single detector or the sum of outputs of neighboring detectors, which can be combined to create images of varying slice thickness. For example, with the Lightspeed scanner, there are 16 detectors of 1.25 mm. The information from these detector rows can be combined into four channels of information, providing nominal slice thickness values of 1.25, 2.5, 3.75, 5.0, 7.5, and 10 mm (Fig. 3). Figure 3 Cross-sectional profile of an equal-width detector design (Lightspeed, GE, Milwaukee, Wisconsin). (A) To acquire four 5-mm thick sections, all 16 detectors are activated. The signals from adjacent groups of four detectors are combined into one channel, creating a virtual detector with a section thickness of 5 mm. (B) To acquire four 1.25-mm-thick sections, only the central four detectors are activated. (From Ref. Rapid advances in technology will soon allow for the acquisition of greater than four channels of data simultaneously. Indeed, MHCT scanners will be able to simultaneously detect eight or more channels by the time of this publication. Figure 4 Multidetector helical CT and matrix array. With four active detectors, single gantry rotation results in four simultaneous slice acquisitions. data acquisition. 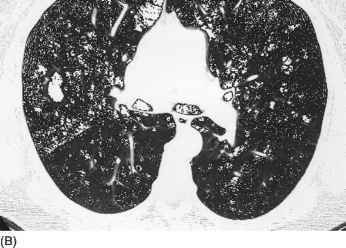 Retrospective reconstruction into thinner slices can be useful for further characterization of small lung nodules or interstitial lung disease and may preclude the need for additional image acquisitions in many cases. It may also aid in obtaining optimal slice thickness for multiplanar reconstructions.